For a long time I’ve wanted a pleated skirt. When I finally decided to make myself one, I was in the middle of a sewing course at Shenkar. Finding a professional to perfectly carry out the pleat folds and gentle sewing was not an easy task. There are many types of folds – vertical folds, sun-shaped folds, and so on. Pleat is usually used for dancer skirts and bride dresses. 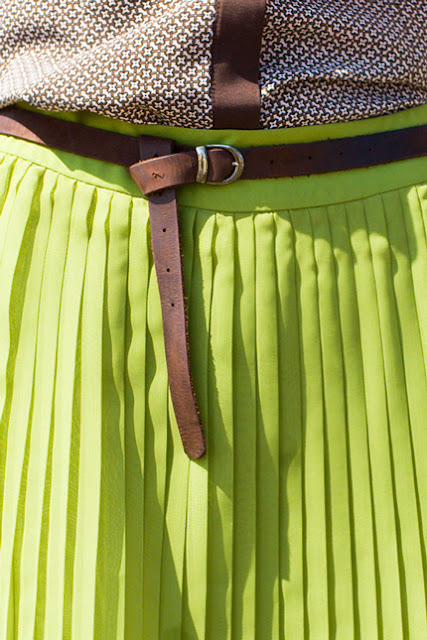 I wanted a tailored but fun skirt, in an unusual color. Finally I decided on a 1.2cm reclining fold. The distance between the folds just seemed to work perfectly. This green chiffon looked interesting, noticeable and surprising in my eyes. Chiffon's come in many fabulous colors. I have a catalogue of over 90 shades – dark, light, smoked and pastel. The ‘Mingling’ blouse is made of silk and viscose, and combines two colors. It’s tailored but still light and every-day. It has a “V” neckline, very feminine and loose. 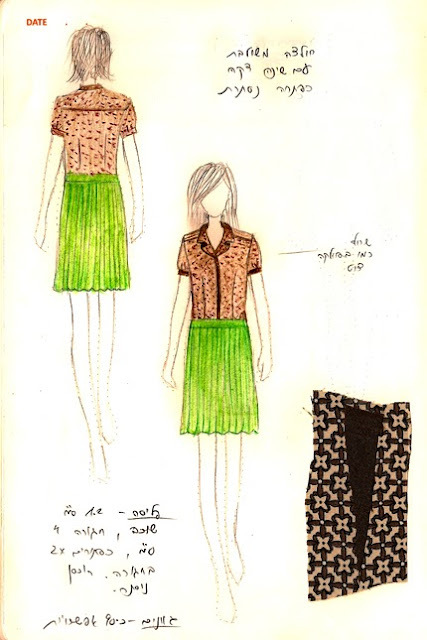 The buttoning is hidden and the blouse can be worn over a skirt or with pants. The skirt touches the body but is not tight-fitting, and the blouse’s sleeves have small creases above the cuffs. Such a lovely color of a skirt.